History: TAGS was told that Ruby was a little shy. As it turned out, although a little tentative at first, she is relaxing quickly. She is curious about everything in the house and in the yard, took to a dog bed immediately, comes when called (she definitely knows her name). Ruby has adorable big brown eyes and a happy face. She has been used as a training dog so her muscles are still fully developed. 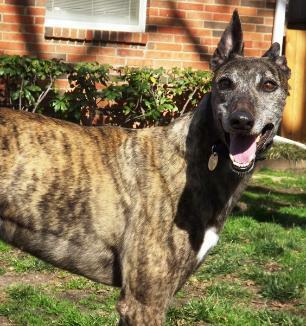 Her Greyhound-Data pedigree shows no races, although she came from the Birmingham track. 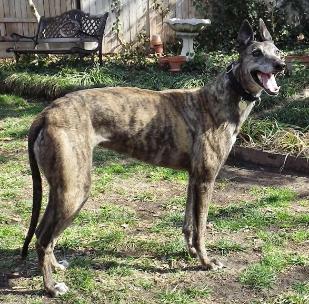 It also appears she may have had pups even though Greyhound-Data says “no offspring”. She is a fairly small girl, having a compact body. You have to see her adorable mule ears – they are either back against her head or straight up. So far she had followed the other dogs’ lead and does her business outside. She slept like a baby on her first night (on a dog bed in the bedroom). She is very affectionate and is already asking for affection. We will, of course, learn more about Ruby’s personality as time goes on, but we can already tell she’s going to be a winner in someone’s heart. What a sweetie. 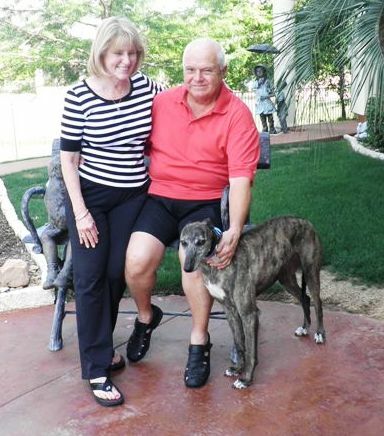 Ruby with her new family, Ken and Candy. 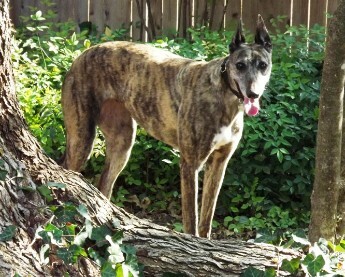 May 1, 2012 update: Ruby found her forever home - congrats to her and her new family. February 8, 2012 update: Although TAGS has had Ruby for a short time, she appears to be very “house adaptable.” She has made herself right at home and cannot get enough human loving. 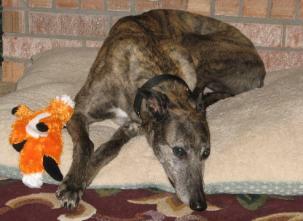 She has shown little to no interest in the cats and small dogs but gets along greyt with the Greyhound in the household. Ruby does love her food. That should make training easier. She will likely make a good single pet as long as she has loving people around her. On the other hand, she seems to like children. She does try to get out the door first, so that’s an open issue (pun intended). So far, one “NO” teaches her it is not a good idea to beg at the table or try to share the human’s dinner. Ruby is also receiving some leash training – which she needs. So far she hasn’t seen any rabbits so walks have been uneventful. 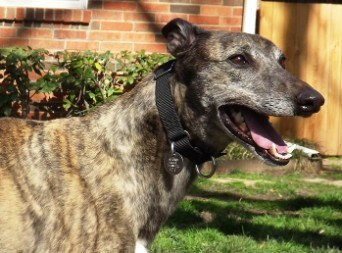 Ruby is the easiest and most adaptable of any foster we have ever had. No mistakes, ever. She lets you know when she wants to go out. I have only seen her with children on walks and she does not does not seem to be afraid of them but is a little timid at first. She has a big desire to please. 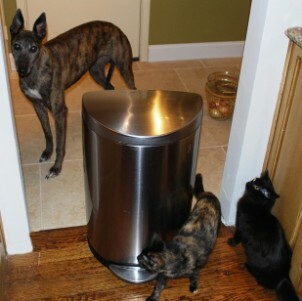 January 27, 2012 update: Ruby’s cat test: Ruby was introduced to five (yes, five) cats of varying colors and energy levels. 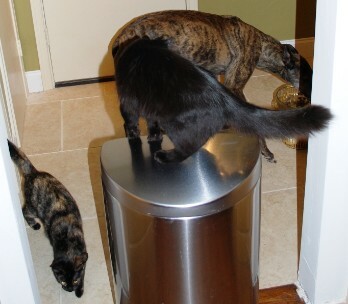 Two are very active, young cats and one is the usual outgoing ”cat tester”. 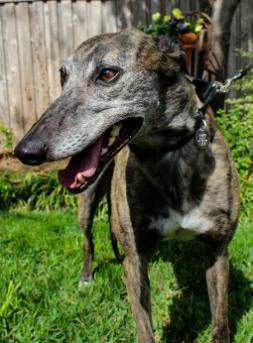 Since Ruby appeared to have very little interest in the cats, she was invited to spend the night (by the two resident Greyhounds). She slept all night in the room with the Greyhounds and cats (well, the cats slept wherever they wanted) – and never moved from her bed. She was comfortable with the cats, and three of them watched her as she ate breakfast. In fact one of the young cats jumped from the sofa to Ruby’s back to the floor. (Ruby yelped because it scared her to have a cat jump on her back!!!) Pictures below tell the tale. 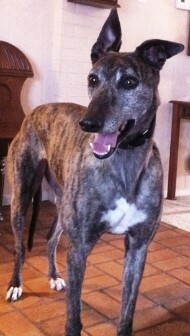 Ruby is going to be fostered in a home with another Greyhound, Italian Greyhound, two cats and a child. More information about her progress will be posted later.